The Wabash Conservative Union will Jonah Goldberg, editor-at-large of National Review Online, on Wednesday March 12th at 7:00 p.m. in Hays 104. Goldberg will lecture on his new book, Liberal Fascism. The event is open to the community and will be followed by a light reception. 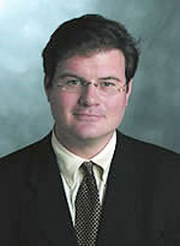 Goldberg is a contributing editor for National Review and contributing writer for the American Enterprise. He writes a nationally syndicated column for Tribune Media Services. Mr. Goldberg has written on politics and culture for the New Yorker, the Wall Street Journal, the Weekly Standard, the New York Post, the Women's Quarterly, Food and Wine, and Slate. A former television producer, Mr. Goldberg has written and produced two documentaries which have appeared on public television nationally; "Gargoyles" and "Notre Dame: Witness to History." Mr. Goldberg has production credits in several other award-winning television productions dealing with American politics and history. He was the producer or senior producer of the award-winning PBS series "Think Tank with Ben Wattenberg" from 1995 to 1998. Prior to his television work, he was a research analyst in social and political studies at the American Enterprise Institute in Washington D.C. as well as a literary agent. Mr. Goldberg is a graduate of Goucher College, and a former member of its Board of Trustees. In 1990, Leadership America named him as one of the top 50 college leaders in the United States. He has also worked for United Press International (London) and Scripps Howard News Service. In 1991 Mr. Goldberg lived in Czechoslovakia teaching English. He currently lives in Washington, D.C.